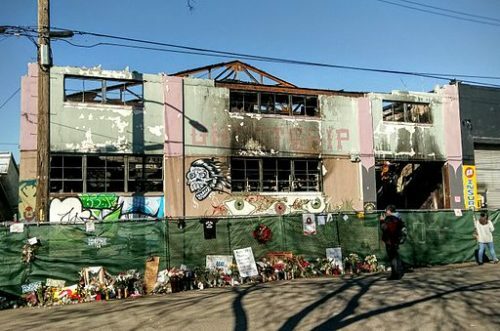 After the multiple fatalities in the wake of the Ghost Ship warehouse fire in Oakland, California, NPQ predicted many ripples in the arena of informal work/life spaces where many young artists create art communities and live and work relatively cheaply. For who that manage such places, the cities in which they sit, and the funders who support them, safety has become an immediate concern. For no one is that more true than Elisabeth Setten, executive director of Art Works Downtown in San Rafael, California. The nonprofit is housed in an 1880s-era opera house that houses the nonprofit’s three galleries, 32 artist studios, and 17 low-income apartments. The space allows artists to live cheaply while creating and displaying their art and is the central engine in a revival of the downtown area. The historical building also had two other tenants: expensive electrical and structural issues caused by aging. Although they passed all safety inspections, Setten acknowledged Art Works was headed towards a health and safety issue. In this case, the city supported the nonprofit. After assisting with a plumbing upgrade, in November, amid what the Mayor of San Rafael noted as stiff competition, the city awarded the nonprofit $197,000 from a federal block grant to upgrade the ancient electrical system. Meanwhile, a crowdfunding campaign headed by the Gray Area Foundation for the Arts yielded $900,000 for the victims of the Ghost Ship fire, which killed 36 people and injured dozens of others. It is unclear if anyone has received any of the funds, and with the February 2nd two-month anniversary approaching, some in the community are getting nervous about just when the money will be issued and who will benefit. A press release from Gray Area on January 25th confirmed that it had received some 400 applications for relief, out of which 136 were qualified to draw from the $900,000 donated. Intake forms continue to be available on the foundation’s website until early March. The relief allocation was intended for victims injured in the fire, the biological families of the deceased victims, and tenants of the warehouse that have been displaced. The market forces that have pushed rents higher in many cities also make the spaces nonprofits use more expensive.